Sue and I flew to Palma on Ryanair and took a taxi to Puerto de San Antonio de la Playa from the airport after texting our hosts on Nine Lives, our home for the next two weeks, that we were on our way. Just after the taxi dropped us off we received a text describing where Mark would meet us – we had already printed out a map of the port. We traveled with a 15kg soft case and 2 x 10kg small rucksacs as hand luggage. We loaded these into the tender and set off to the 37′ Prout catamaran. Francesca was there to welcome us on board but soon after we arrived burst into tears because she had been so worried about accommodating us. They had moved out of their cabin over the central cockpit into a cabin in the starboard hull, forward of the galley to make space for my long frame. 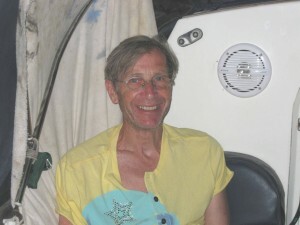 When we were aboard we set sail to a more comfortable overnight spot on a mooring buoy about an hour away. We had our first swim to cool down and wash away the sweat and dust of our journey and then eat a meal of salad and potatoes. 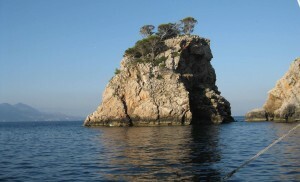 Next morning we sailed across Palma bay to Portals Nous, a cala familiar to me from numerous trips on Alex Humphrey’s boats years earlier. Mark prepared savory pancakes for lunch – we had these most days – and salad and potatoes for tea. These meals and mueseli for breakfast were our staple diet for the fortnight and were supplemented with a choice of various herbal teas. Sue and I swam to the beach that day and next morning as well and I tried snorkeling. 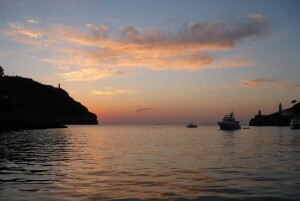 Our next port of call was Santa Porta and we stayed there two nights. We treated M and F to a meal. 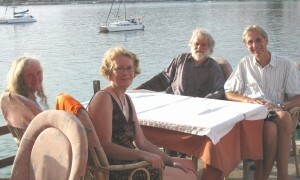 We chose a restaurant facing west overlooking the yacht and the bay but the place was a bit like Faulty Towers. The food took ages to come and arrived in the wrong order. People at the next table had a deadline to meet and the food only arrived just before and when it did come two people’s lasagne was stone cold so they just up sticks and left. Apparently the host and hostess had a domestic. Our food was fine when it did appear and we enjoyed watching the sun go down. Next day we did a supermarket shop and I treated myself to some milk, a 12-pack of beers and a carton of sangria (I was the only alcohol drinker and like white coffee). We also bought loads of fresh fruit and salad stuff. In the afternoon Mark and I sailed the tender round the bay in quite strong winds. 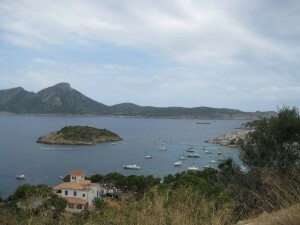 We then visited Dragonera, an island off the western tip of Mallorca. We utilised a buoy to moor to. Francesca, Sue and I walked to the northern tip of the island, which is a nature reserve, on a well marked path and were plagued with seagulls dive bombing us when we approached their chicks. 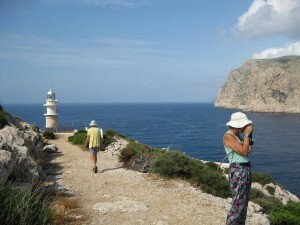 The views from the lighthouse at the tip along the mountainous north coast, down onto the waves crashing onto the rocks below, across the straits to Sant Elm and back to the craggy peaks on the island were stupendous. 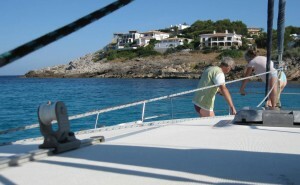 Mark, who had stayed with the boat in case the owner of the mooring buoy should appear to claim it, decided the bay was too small to over night in so we headed across to Sant Elm. The place was quiet and pretty and Sue found a nice place to eat. 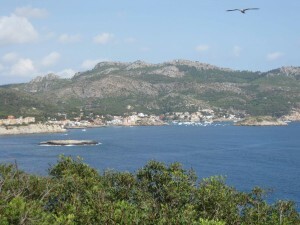 Next day we went walking in the hills and admired the views of Dragonera. We sent off our postcards from here. In the middle of our second night’s stay the wind increased sufficiently for the boat to be uncomfortable to sleep on so Mark and Francesca up anchored and set off north. 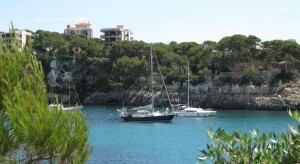 I was disappointed when we sailed past Puerto de Soller as this is a very pleasant stopping point. Also the sea was quite unpleasant. But we had a following wind and were making good progress so Mark decided to press on. 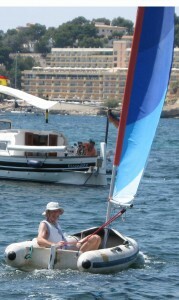 We were more than half way to Pollensa when the wind did a 180 turn. We put the motor on and battled into the wind and sea for half an hour but it was quite unpleasant so we turned around and headed back to Soller. We arrived there in the late afternoon and Sue and I went ashore to look around, promising the others we would let them know whether we were going to eat there. We took longer than expected and received an anxious text even though we had decided we would eat aboard. 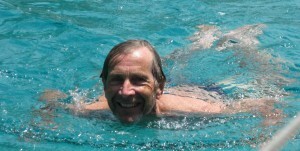 As usual Sue and I went for our early morning swim after I had done my salutations to the sun (a yoga routine). In our absence a leak had been discovered in the port rear cabin – the “poo loo” and dressing room. The port bow cabin is the “wee loo” and shower; between these two is the navigation table; the starboard bow cabin is the larder; the starboard stern cabin was M & F’s cabin as they had given up their bed to us because of my size; between them is the galley with cooker, sinks and fridge. The leak was a joint to the calorifier and Mark decided to remove this as it was never used. This and drying all the wet stuff took the two of them most of the day. 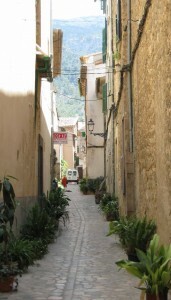 We decided to catch the tram into Soller proper. We had lunch there, visited the train station which housed an exhibition of paintings by Miro and another of ceramics by Picasso. We wandered around admiring the quaint streets and Sue bought shoes for the wedding. 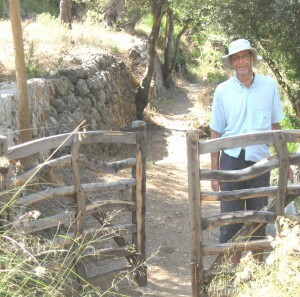 We then walked back to the port, a longer and more adventurous walk than we were expecting as it meandered between the hills and farms. In the evening the four of us strolled along the length of the harbour, inspecting the various leisure and commercial craft as well as the menus of the restaurants we passed. I chose one because they had gazpatcho on the menu and it proved to be a good choice. 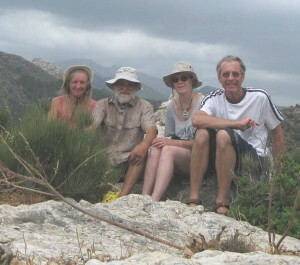 Next day we set off north but the winds were so light that we turned around and returned once more to Soller. We decided to try a night sail. This turned out to be, for me one of the highlights of the holiday. I was woken at about 12.45 and took the 0100-0300 watch on my own, albeit with Mark asleep in the cockpit beside available for any crisis. It was a moonless night and navigation was by satellite. The wind was quite strong, going up to 25 knots and at times I was worried whether we had too much sail up but not worried enough to wake up the skipper. The satellite navigation system was set to track all the way points entered from the pilot but I decided to go further off shore from a high headland which seemed to loom too close for comfort. A couple of bright lights directly in front of us that appeared from behind the genoa startled me as I thought we were on a collision course with another boat. They were actually astral bodies, I think Venus and a star. Mark took over at 3 a.m. although I was enjoying myself so much I would have willingly extended my watch. 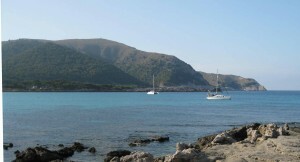 When I awoke we were anchored in a beautiful sheltered cala just in the Bay of Pollensa on the north eastern coast. We had this all to ourselves for a while and I did my routine of breakfast, sun salutation and swim and then we all four set off for a walk up the pine and shrub covered valley. It was lovely until we came across human settlements where bare earth replaced the natural vegetation. At the summit we crossed a road and looked down over the north-west coast where we’d earlier sailed past. 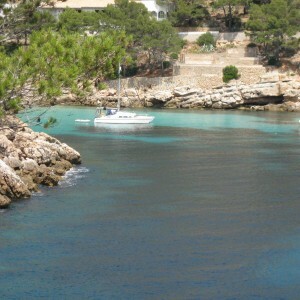 The cala became busier so we uped anchor and sailed east across the Bays of Pollensa and Alcudia arriving at Cala Rajada in the early evening. On the way we had witnessed, first a flying boat racing across the water as it picked up water to fire fight, and then a rescue helicopter practising picking up a buoy that it had previously dropped in the water. 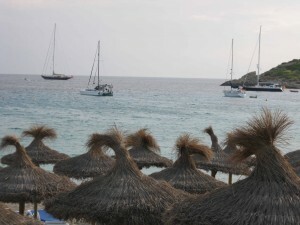 The beautiful sandy beach at Cala Rajada was heavily commercialised with jet skis and other high speed craft shooting about. Fortunately we only discovered this the next day. That evening we explored the town and found a harbourside restaurant to eat in. Next day was market day and three of us set off there. Mark decided he would sail round the headland that separated where we were anchored from the harbour. We were to meet him there with our purchases – a supermarket shop was also on our agenda – and then he would take them back to the yacht. Mark didn’t appear and eventually we made phone contact and found that he hadn’t been able to get round the point with the winds as they were. It was very hot and we were glad when we eventually climbed back aboard. 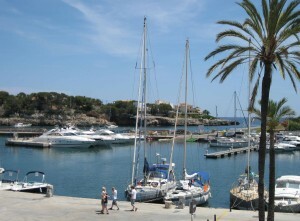 We didn’t enjoy the anchorage now the bay was full of the noise and wash of all the powered craft and set off after lunch for Porto Cristo. En route the sea was quite choppy and the shelter of the anchorage in Porto Cristo was welcome. Next morning, however, a marinero asked us to move further out as we had anchored in the bathing area, unwittingly as the buoys had disappeared. Mark decided to do this with manpower. We pulled up the stern and bow anchors and he set to with the paddle he had rigged up at the stern. I decided to assist him by pulling the yacht by rowing the tender. After about a hour’s efforts we had moved to a suitable position and dropped anchors again. We now were close to the narrow part of the channel and felt the wash from large tourist boats. 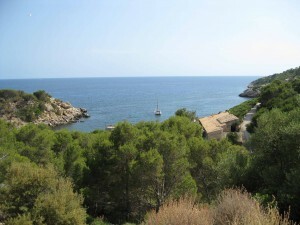 In the afternoon we went to the caves of Drach which ar a short walk from the harbour. These are a huge tourist attraction and it was galling to have to pay so much to view a natural feature and to have to queue for so long in the heat to get in. However, they really are spectacular and so huge the crowds were not a problem once they had dispersed. The musicians on a boat on the underground lake were lit up beautifully and we felt the experience was uplifting. We had intended to take Mark and Francesca out for a meal on our last night but instead opted for Mark’s pancakes on the boat. Next day after ourmorning routines we packed up and were ferried across to catch the bus to Palma. 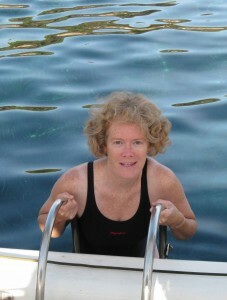 I did not want to leave the wonderful life on the boat but our flights were booked and Sue was ready to return home.